Breast Cancer Action is not your typical breast cancer organization. Our passionate, talented, tireless staff and our engaged grassroots membership are our strength. Since our founding in 1990, we have had an outsized impact because of the power of people coming together. We are currently hiring an accomplished Campaigns Coordinator to lead and run our national digital campaigns. 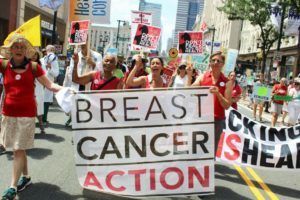 Breast Cancer Action is fiercely independent and refuses corporate funding from any company that profits from or contributes to breast cancer, which means we can do the work that other breast cancer organizations don’t do. We value diversity and each member of our team brings their own diverse lived experiences along with the depth of their professional expertise to inform and enrich our work together. We are an ambitious organization and successful team members bring big, bold ideas as well as a relentless determination to get the actual work done. Our work together is deeply collaborative and driven by our organizational values. The Campaigns Coordinator plans and executes all of our national digital campaigns and on-the-ground actions, most notably Think Before You Pink® (TB4UP), which calls for accountability and transparency in mainstream pink ribbon marketing and culture. In addition to our annual TB4UP corporate campaign, we do year-round policy and educational campaigns on key breast cancer issues. This person will work closely with other key staff and organizational partners to identify both rapid response and proactive campaigns. The Coordinator works to expand and engage our diverse national membership. In addition to running digital campaigns, the Campaigns Coordinator develops webinars and other educational materials in support of our work. This is an exciting opportunity for a proven grassroots digital organizer who is eager to work collaboratively in pursuit of big goals. The Campaigns Coordinator is a full time, salaried position based in San Francisco and reports to the Executive Director. Manage all aspects of our campaigns, including writing ealerts and other collateral, keeping to timeline, coordinating tasks across staff, tracking goals, etc. Recruit and manage volunteers, including our Community Leaders program. Applicants should have a demonstrated understanding of and commitment to women’s health issues from a feminist perspective, social and environmental justice, and grassroots organizing. The successful applicant is a talented and strategic grassroots organizer with demonstrated experience running online campaigns, is a powerful communicator and strong facilitator who can engage diverse stakeholders, is self-motivated and an excellent multi-tasker, and enthusiastically embraces the mission and work of Breast Cancer Action. Applications will be accepted on a rolling basis and position will remain open until filled. Please email your resumé and a detailed cover letter, highlighting relevant experience along with your salary requirements, to info@bcaction.org using the subject line “Campaigns Coordinator.” Please include a writing sample that provides evidence of your ability to clearly communicate complex information in an accessible way (no longer than 4 pages). No phone calls please. People of color, gender and sexual minorities, and people with a personal experience with cancer are strongly encouraged to apply. The Campaigns Coordinator is a full-time, exempt position. Salary is commensurate with experience. Benefits include medical, dental and vision coverage and three weeks paid vacation.